Today I am thankful for the ability to still approach things with a childlike perspective. I do not do it as much nowadays, but when I was younger I would attack different tasks with the innate perspective of a person who thought that they could never fail. If there was something that I wanted to do, no matter how challenging it was or how seemingly out of reach of my capabilities it was, I did not think twice about whether or not I could do it. As long as it was something that would likely not cause me to get in trouble, I just balled up my sleeves and went for it. Looking back on those days, I realize that part of that “I can do anything” perspective that I had was founded in who I am as a naturally driven and generally motivated person. But part of it was simply because I was a child. 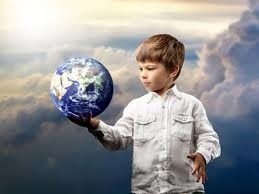 It seems that children have a tendency to believe that they can do anything, that the whole world is theirs and that it is merely waiting for them to discover it. Now this may be because they have yet to encounter the reality of what it is like to live life as an adult with rules, requirements, and deadlines. In thinking about this concept of approaching things with a childlike perspective, I realized that this perspective was something that had become dormant in me once I became an adult. The little girl who thought that she would find a way to give everyone in this world a platform to share their concerns, beliefs, and needs, the one who as a teenager knew that when she went to college she was going to triple major in biology, chemistry, and english, the one who just knew that whatever she wanted in life she would have, grew up to become a woman who, despite accomplishing many things, imposed more limits upon herself than society ever could. She unknowingly hid that childlike perspective that said that she could and would accomplish anything that she set her mind to.